As a parent the one item you will use most is nappies with the largest daily amount being used in those early weeks. In fact each child will use thousands of nappies before they potty train (it's a pretty daunting number!). Choosing the right nappies to use is almost as daunting. There are all the big brands, then you have the smaller brands and you also have all the supermarkets own brand ranges to choose from. With D we used a lot of different brands of nappies and finally we settled on Little Angels. 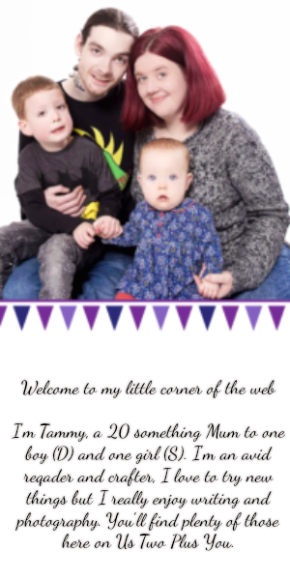 Little Angels was the brand of nappy I was going to use for Baby S, so when they got in touch I was excited to see if anything had changed about them. If you have never heard of Little Angels, they are ASDA's own brand range of baby items including nappies, wipes, bottles, baby food and toiletries just to name a few. Little Angels Nappies have super absorbent gel beads inside which allow the nappy to soak up to 30x its own weight! This means it will hold a lot of liquid. This is perfect for babies who take long sleeps through the night or ever day. Baby S is only sleeping in 4 hour stretches so we haven't really tested how absorbent they are. One of my favourite features on the Little Angels newborn nappies is that they have an extra strip of fabric just beside the leg cuff. I love this little strip! (seriously!) That one little strip has made a difference on many occasions when we have been competing with those poonami episodes I bet you've all at least heard of. I was pretty surprised when I figured out that some brands of nappies don't have this (I thought it was pretty standard!). 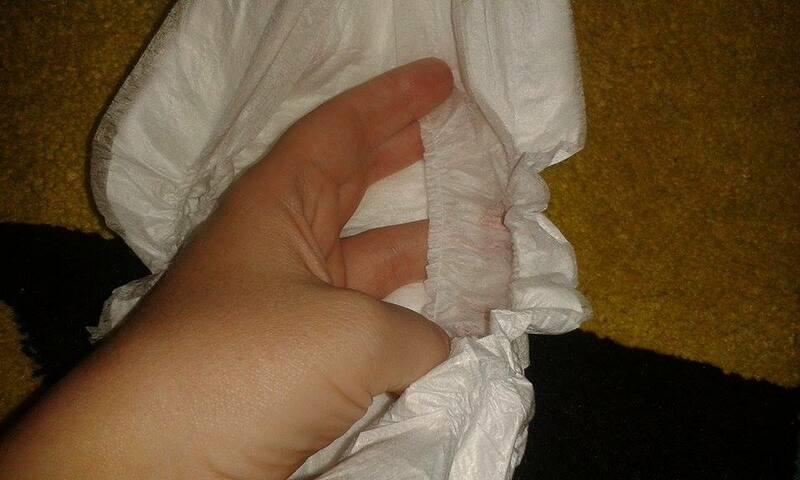 I also find that checking if Baby S's nappy has been pooped in is much easier with this extra line of fabric as it is almost see through so you can quickly see without the risk of getting poop all over your fingers if they have. Another feature offered by Little Angels Newborn Nappies is the wetness indicator, a little yellow line which runs the length of the nappy on the outside. 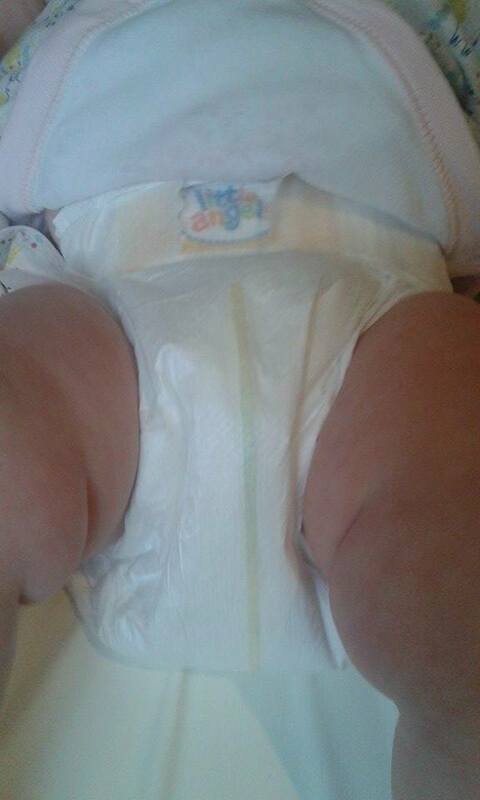 This line will turn to blue when the nappy is wet and if it gets slightly wet it may go a very light green colour like in the picture of Baby S above (Straight after her nappy change, of course). I have found that this can be another poop indicator (it may only be for breastfed babies, since their poop is more liquid). If Baby S does a poo I find that the nappies wetness indicator will go very greeny/ blue and will only do it from about half way down the front of the nappy leaving the top area still yellow. There are a few other features to Little Angels Newborn Nappies too. 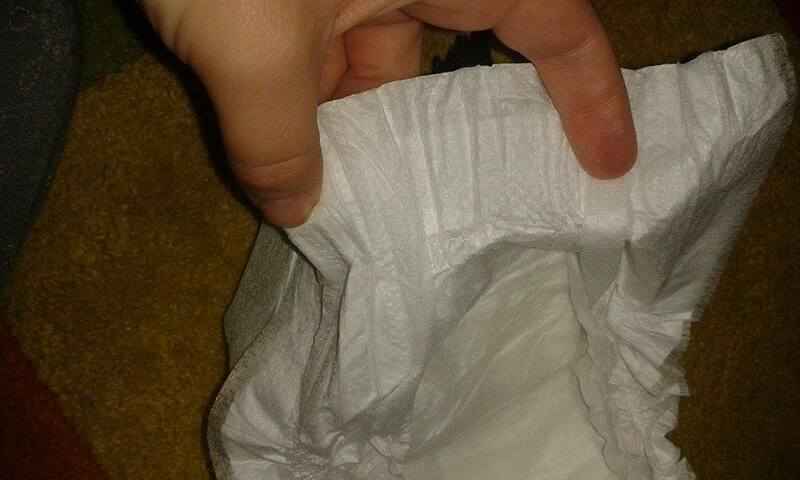 They do have an area cut away for the umbilical cord on the front of each nappy. Since Baby S's umbilical cord came off before any of the nappies fitted her properly I can't really comment on how that part works. Even in the tiny baby size we had to fold the top area over the straps to avoid rubbing her umbilical cord during the early days (She was quite small). 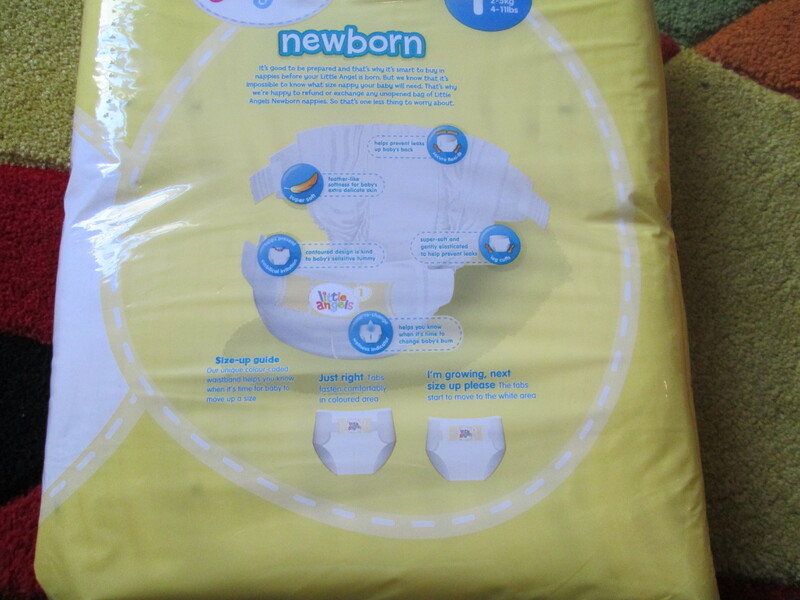 The Little Angels Newborn Nappies also have "feather-like softness" Personally I am not really sure what that should feel like, however I did have a good feel of the inside and they do feel very soft to the touch. The final feature of Little Angels Newborn Nappies is the elasticated back which is to help prevent leaks from going up babies back. Personally I don't think this worked very well for us. This was the only area from which we have ever had a leak with Baby S but I am very aware that all babies have different body shapes and I never remember having this problem with D when he used Little Angels Nappies. 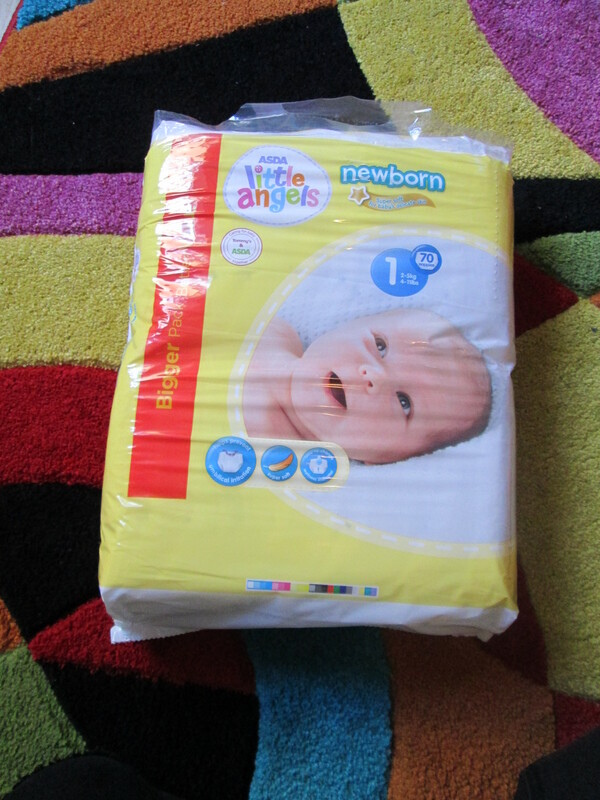 This has not actually put me off using them since it has only happened a few times and we have used Little Angels full-time for about 2 months and we are still using them at night (while using cloth nappies through the day). You can purchase ASDA's Little Angels Newborn Nappies costing between £1 and £3 by clicking on the link. Disclaimer: I received the items above in return for an open and honest review. All opinions expressed above are my own.